From a technical perspective, yesterday’s wide spread down bar on the daily silver chart, comes as no great surprise, and as outlined in my market commentary for the 28th July 2009, I had become increasingly concerned at the weakness in the daily spot gold chart. 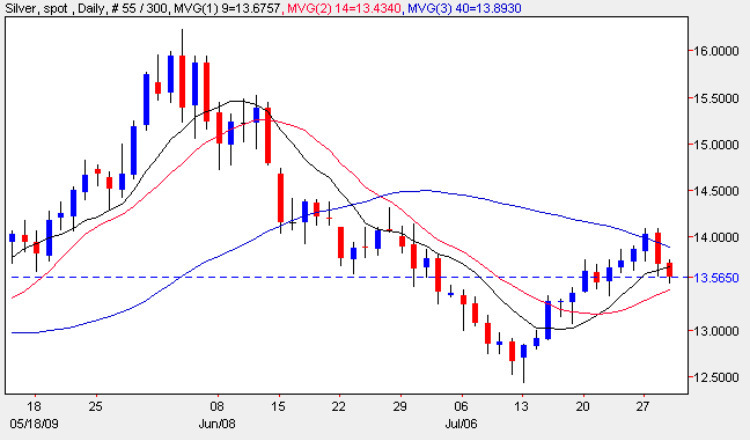 Despite silver’s brave attempt to struggle higher over the last few days, the price was eventually dragged lower as the weakness in the gold chart duly converted into a steep fall for the industrial commodity, which ended the trading session with a wide spread down bar, closing below the 40 day moving average, but finding some support from the 9 day average. This candle has now given us a clear bearish engulfing signal which we would be wise to consider carefully, and the question now, of course, is whether this is simply a short term reversal lower, or the start of a much deeper move? The answer will largely depend on the support levels lying below and whether the price of silver can find the required support to bounce back. The first of these is at the $13 per ounce level, but should this fail to hold then a re-test of the $12.50 level would seem likely. For any move higher we now need to see the $14 per ounce level breached, but as we saw from yesterday’s price action, this has once again proved the be spot silver’s Achilles heel with a rerun of the failed push higher and subsequent fall of late June now a distinct possibility.